FRANCES: The first trip of the year! We went to Dog River and put in about 6:10 am. We started a little later than we wanted, but then the first time out always takes longer -- it takes longer to remember which bungees go where loading the boats. And you forget something before you leave and have to go back in the house to get it. So we missed the sunrise, but that can be a goal for next time. 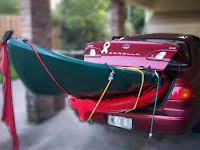 GLEN: Frances' securing of our kayaks in our small Toyota Corolla is a work of art! I was a little concerned that the water might actually be too cold. I had been checking the temperature and it had been running in the low 70s. When we put in and my feet touched that cool water, that was my first thought, and in fact I said, "Now that water is cold!" That was the last time, however, I thought about the water temperature in a negative sense. I won't ever get used to the feeling of the first shock of cold water. Even as I write those words, however, I remember that it's a mind thing more than anything else. From now on, therefore, I'm going to take a different attitude toward the matter. Instead of dreading jumping into the cold water of a pool, or feeling it on my feet a the outset of a kayaking trip, I'm going to choose to view the experience in different terms. Life is a matter of attitude and expectation. If we expect the worse, we'll get it. Expect God in our experiences, however, including such small things as a brace of cold water, and we'll get Him. We set out and decided to go in a different direction than we had ever been on Dog River before. I had meant to print a map, but hadn't done so before we left. I didn't feel entirely comfortable paddling without one, but I had seen the satellite view of this area enough to not be afraid of being lost forever in a marshy delta. Sure am glad that Frances has some notion of where we're going! Me, I'm a feather in the wind with not much regard to getting back. "Full speed ahead, D--n the torpedos!" Torpedos! Now those would be neat to launch from kayaks! "Engineering Department (a.k.a. Frances), get to work on that!" There's no telling where you would end up if you launched a torpedo from a kayak! I do like to know where we are going and I certainly like to know how to get back. We are fortunate to have wonderful landmarks in almost all our put-ins that are easy to find. I do use the satellite maps alot as well, so I know how the area looks before we go. We take turns being "Pocohontas and John Rolfe" leading our little exploration party. To go where we wanted to go, we had to cross Dog River. Now we have crossed Blakeley River before, so I don't know why I always felt such trepidation about the open expanse of Dog River. Ever since we have started paddling there though, I have thought it would be a hard float to cross that river. As we talked about whether to go in that direction or not, Glen jokingly called me a "wimp" and that did it. I tightened up my core muscles and pulled my little boat hard and as fast as I could across the river. It felt like an accomplishment to get to the other side. although I know Glen means that in the most positive of ways. We followed one little inlet and paddled along by the river houses until it brought us out to the river again. We followed the shoreline, waiting to find a particular creek I had been looking at on the map earlier. We came upon a large opening to a creek and looking at the watch I was surprised to see we had already been out 45 minutes. We still had to head back down the river and across it get to the put in, so we decided to turn back. Since then, we've taken much longer trips, in preparation for our tran-Atlantic voyage. Hope there's a lot of islands along the way, so I can stretch out my aching hips. Heading home we were against the current and were also having to navigate the waves from the boats now starting to come out for the day. After reading about a "hit and run" boat-kayak accident that killed a kayaker this year, I was much more watchful of the boats. One of the concerns about the speed boats --beside the speed at which they can be upon you -- is the fact that they may have been consuming alcohol and also may not be paying attention to little kayaks out on the water. To be honest with you, they tend to frighten me more than the alligators. Except when the alligators have also been consuming alcohol. Talk about grumpy! One interesting thing this year was I could no longer wear my favorite red PFD. Having lost 56 pounds, it no longer fit and was too big to be safe. I've never felt Glen's fit correctly, (remember the "Where'd Glen Go?" story?) or had enough buoyancy for him, so I made him wear this nicer red one. It fits him much better than his old green one. I feel safer with him wearing red, too. It makes him more visible in the water. 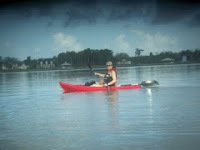 His dark green kayak can sometimes blend in with the surface of the water, so the red helps him to stand out. There's no need to keep bringing up, "Where'd Glen Go? ", is there? Regarding the "more visible" red PFD, I guess it'll make it easier to find the body. Coming back to the put in, there was a group of pelicans diving for their breakfast. I enjoyed watching them as I let my hands rest in the cool water (I wrote about the pelicans in The Powder Room.) The whole trip took two hours, which was a good length for the first one of the year. The temperature, both water and air, were perfect. 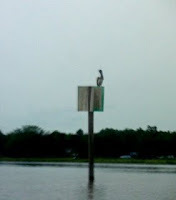 A word to the wise: pelicans won't share their breakfast. Greedy little critters.